H803GPFD, H805GPFD with B+ or C+ SFP module. Q: What is the difference between GPFD and GPBD board? Q: What is the difference between H80D00GPFD01, H80D00GPFD02? A: We don’t suggest you order according to this BOM, this BOM is mostly used for manufacturer producing purpose, Basically choosing GPFD card, we just need to know: 1, H802GPFD, H803GPFD or H805GPFD? 2, with B+ SFP Module or C+ SFP Module? Q: Does GPFD has any version requirement of OLT software? A: Yes, only V800R008C01, V800R009C00 or above version support GPFD, also please make sure your OLT software included the package of your GPFD board version. A: Yes, but not suggested, most of Hza-network customers even use C+ module, are max using 1:64 split ratio. Q: Can I get technical support from Hza-network if we purchase GPFD from you? A: We will able to provide technical support service for customers whose OLT and GPON card are both from us, kindly note we will charge for the technical support service. Hza-network suggests customers purchase the OLT and GPFD card from the same professional supplier so as to avoid compatible and technical issues. Q: Does the GPON SFP Module included in GPFD? A: Yes, with GPFD board, 16 B+ SFP Module are included for free. Q: Can I do twice splitting with GPFD? A: Yes, you can, just make sure the optical power is within the receive side range. Q: Can I purchase GPFD with C+ module? Q: Can I use a 3rd party ONT with GPFD? 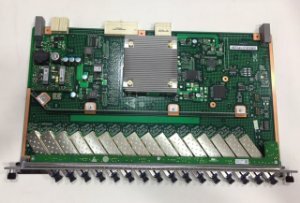 Q: What is the power consumption of GPFD board?